Prepare soups and stocks, strain out seeds, stems and skins from fruits or vegetable to make your own jams and jellies, applesauce or babyfood, or it can also double as a colander for rinsing fruits or pasta. A great tool for any kitchen. QUALITY - 18/8 Stainless Steel construction. TOUGH - Perfect for commercial use. USES - Perforations (not mesh) allow liquid to pass through while retaining pulp, seeds, stems and skins. Also perfect to create smooth, silky soups and stock. 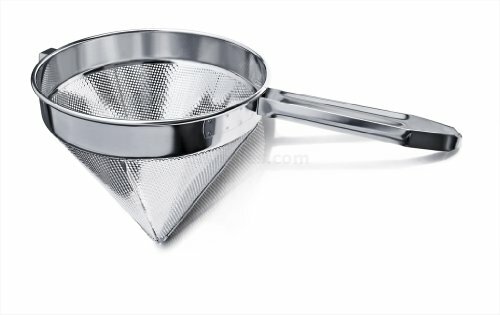 EASY TO USE - Hook on one side allows the strainer to rest on a pot or bowl while the liquid drains. OPTIONS - Available with 3mm Coarse or 2mm Fine Perforations, in 5 sizes. View More In Colanders & Food Strainers. If you have any questions about this product by New Star Foodservice, contact us by completing and submitting the form below. If you are looking for a specif part number, please include it with your message. Presto Pure Reusable Hemp Straining Bag for Soy / Almond / Nut / Seed Milk, Yogurt, Fruit Juices, Coffee and Tea - IAE17H 12x12"